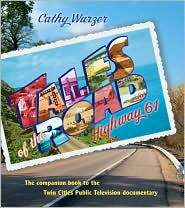 I believe Cathy Wurzer's Tales of the Road: Highway 61 is the first companion book I have ever read. The companion happens to be a documentary that aired on Twin Cities Public Television on March 23, 2009. Unfortunately, I did not watch it because I was in the dark about the book and the documentary. As a fan of both Morning Edition and Minnesota Public Radio, I always perk up when I see the hosts and their works outside of my car. Just as I was fascinated by Kerri Miller's Talking Volumes interview with Judy Blume at the Fitz last summer, I became interested when Jodi updated the Minnesota Reads calendar to show Cathy Wurzer appearing at the Barnes & Noble in Edina on March 24. Although I did not go that night, I did manage to purchase the book. Wurzer took readers on about a 425-mile journey on Highway 61 (thanks Google Maps) from Grand Portage-near the Minnesota/Ontario boarder-all the way down to La Crescent, a town just across the border from La Crosse, Wisconsin. Along the way, we pulled off this oft-realigned road sixty times to survey various points of interest in three regions: the North Shore, the stretch from Duluth to St. Paul, and the scenic Bluff Country next to the Mississippi River. Sometimes these points were nothing more than a concrete footing from the long-gone Outlaw Bridge near Grand Portage or a locked iron gate to Bramble Haw, a wooded area south of Old Frontenac. Other times we are treated to beautifully restored buildings, such as the Soo Line depot in Moose Lake and the Sheldon Theatre in Red Wing. As I would expect from Wurzer, the information in Tales of the Road is well researched and written. For only being about 120 pages long, there is a significant notes section complete with sources on each particular stop she made on Highway 61. There is also a wealth of photography to accompany each stop; some pictures showed past glory while others showed current states of decline. Wurzer combined written and oral histories, along with the photography, to provide a comprehensive picture illustrating many the unique places along this stretch of highway. There is a big however that inhibits my joy of this book's contents. Although I am a history buff in general and enjoy the unusual and strange angles associated with Minnesota’s history in particular, the histories of the many indigenous tribes always occupy my mind. Throughout Tales of the Road, Wurzer made many references to indigenous people. However, most of this information served as background information to supplement the main story of the particular place. An example of this was the story of the Nemadji Tile and Pottery Company of Moose Lake. Wurzer included the marketing campaign of Nemadji Pottery, as written by one of the owners, Clayton James Dodge. Wurzer rightly showed how native images and fantasies generated by non-indigenous people made (and still make) a tremendous amount of money. However, rather than leave it at that, Wurzer gave the Nemadji Tile and Pottery Company a pat on the back by saying at the end, “Not bad for a company that based its business on the marketing of a myth” (63). Are you kidding me? Wurzer gave a big attaboy to a company’s ability to make money despite the fact they perpetuated the stereotypes white people have about indigenous people. While I am sure Wurzer believes this myth is wrong, it is still disturbing that a person can simply set this aside and congratulate the making of money off a myth, especially one that perpetuates misinformation and hatred even today. This was a disappointing comment that clouded what was otherwise a fantastic book.